Centro Destrict is locatit in the Valles Centrales Region o the State o Oaxaca, Mexico. 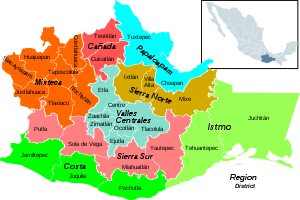 The destrict includes the state caipital Oaxaca an satellite touns. The destrict haes an average elevation o 1,550 metres. The climate is mild, wi average temperatures rangin frae 16°C in Winter tae 25°C in Ware. ↑ "El Estado de Oaxaca". Oaxaca Travel Guide. Retrieved 2010-07-09. This page wis last eeditit on 11 Mairch 2018, at 01:51.